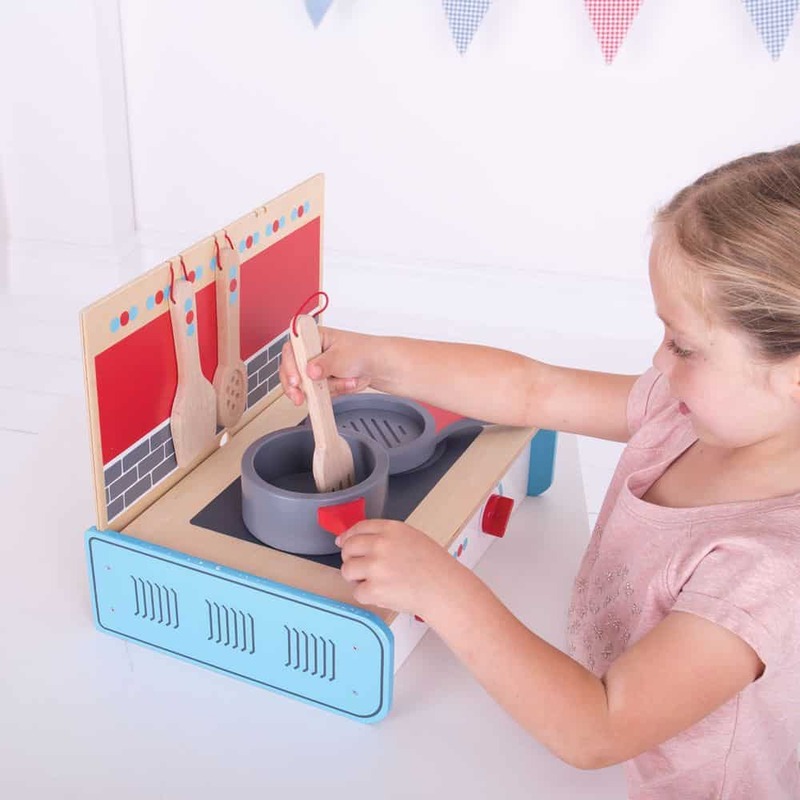 A wooden toy kitchen is one of the best toy investments you can make. Children love them, they inspire endless amounts of imaginative and creative play, and the educational and developmental benefits are boundless. Every child should have one. Not to mention the fact that having a play kitchen in your home might give you enough time to make dinner or unload the washing machine while your child is happily engrossed in healthy, stimulating, open-ended play. There are plenty of articles on the best toys for children and the top toys that every child should have. And all of them, even the ones discussing the idea that children need fewer toys, have a toy kitchen or other role play toys somewhere on that list. Why a wooden play kitchen specifically? There is an incredible range of play kitchens available. And of course, as a parent, you want to choose the perfect one for your child. Safety will obviously be high on the list, as will choosing a toy that is non-toxic and built to last. Especially when it comes to a something like a toy kitchen that will be played with every day for years to come. Investing in a timeless wooden toy, made from responsibly sourced materials and child safe non-toxic paints, is not only better for the environment, a valuable lesson we need to be teaching our children from an early age, but better for your child too. Here are some of the reasons you might want to choose wood over plastic when it comes to investing in a toy kitchen. Wooden toys are more durable – Wooden toys tend to stand the test of time far better than their plastic counterparts. Wooden is better for the environment – Plastic is a big issue at the moment with show’s like “Drowning in Plastic” and “The Secret Life of Landfill” making us all the more aware of the fact that plastic, once made, is there forever. Choosing alternatives to plastic, that have been sustainably sourced, is a great and easy way to do our bit. Wooden toys are safer – Plastic is made from petroleum which is not necessarily something you want in your child’s mouth. And let’s face it kitchen toys, are bound to end up in little mouths. Wooden toys are less distracting – An all singing all dancing plastic kitchen with lights and noises may seem like it will provide more interest and excitement for your child. But evidence suggests that the opposite may actually be true. A Wooden kitchen will grow with your child – The way that children play with a toy will change over time. Coming back to toys months later and playing with them in different ways. And finally, they look good!! – Once you have children, toys become part of your life and your living room. It might not be for you but you are going to have to look at it every day. So why not choose something that looks and feels beautiful. Choosing the right toys is an investment not only in the toy itself but in your child’s future. Children learn through play. Playing is serious work as far as children are concerned. And children love acting out different roles and scenarios through imaginative games. Role play of this kind develops so many key skills, from social skills and emotional understanding to problem-solving skills, numeracy and literacy. These skills are vital in helping children grow into healthy, well-rounded individuals and so it is essential to incorporate this type of play into their everyday lives. Creativity and Imagination – these are skills that children seem to have in abundance. However, it is imperative that as parents we spark and encourage this imaginative creativity as often as we can. 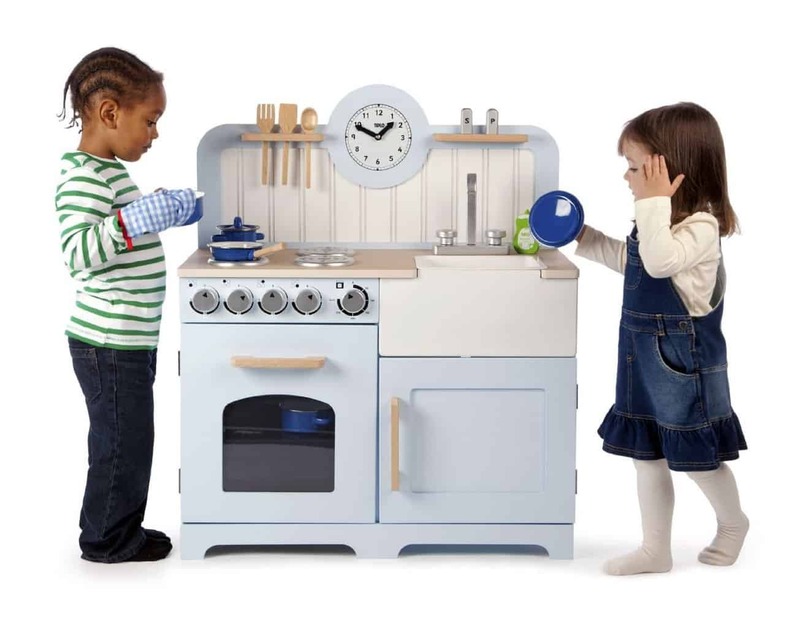 Give a child a toy kitchen and they may take on any number of roles in their imagination. Language and communication skills – Playing these games is a great way to develop language and communication skills. Children will act out their role vocally and engage with you or other children. They learn the names of new foods and objects as well as actions like stirring, draining, chopping, and opposites like hot and cold. Social skills – With communication skills come social skills such as sharing and taking turns. When playing together children will have to negotiate who will play which role or discuss what they would like to cook. Then find ways of working together to get the job done. All incredibly valuable life lessons. 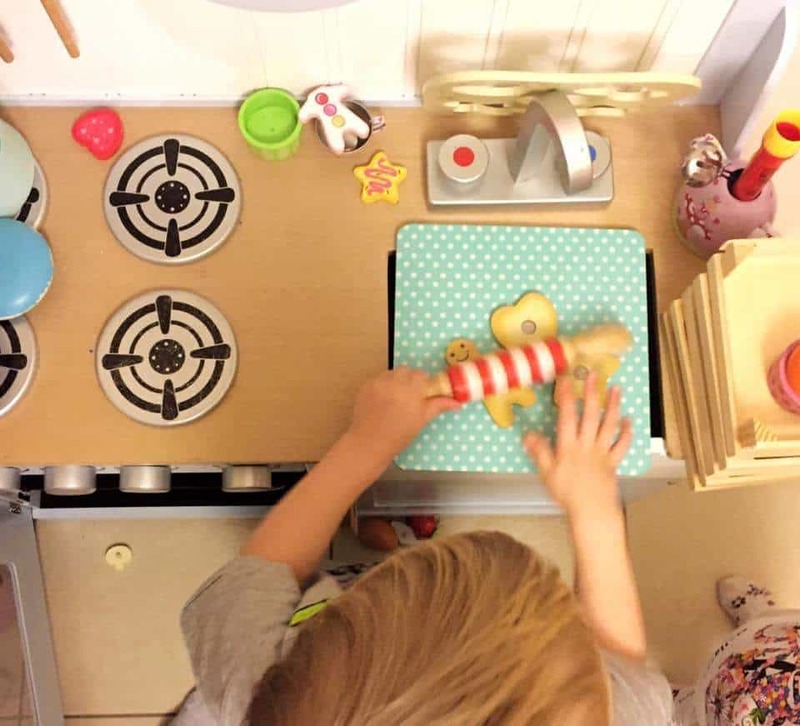 Problem-solving – It might not seem obvious at first, but playing with a toy kitchen is a great way to develop a child’s cognitive ability and problem-solving skills. They need to drain the pasta but can’t find the colander. Is there something they can use instead or can they find it? Life Skills – Pretend play is a great way for children to start to develop like skills. Not just sharing, turn taking and team work as mentioned above, but playing with a toy kitchen will also help with learning other skills such as setting a table, doing the washing up, and how and why we need to make healthy food choices. Independence and self-confidence – Imaginary play is a great way to encourage independence and build a child’s confidence. Having a kitchen of their own, with their own cupboards to organise and appliances to look after, will encourage independence. Finding out that they can entertain themselves is a great way to build independence and confidence in a child. Numeracy and literacy – For little ones counting vegetables or making sure they have the same number of knives and forks to set the table with is a way of learning to count without even realising they are doing it. As children get older literacy can easily be included in kitchen play as kids write shopping lists or menus as an integral part of the game. Buying a kitchen is a big decision, whether it’s a toy one or one for your home. And there are probably a few things you will need to consider first. What do you want from the kitchen? How big does it need to be? Or how small? What age child or children is it for? How much do you have to spend? 1. Size – How much space do you have? 2. Style – This is a toy you are going to have for a long time, so choose the one you like the look of. 3. Budget – Think about how much you want to spend. 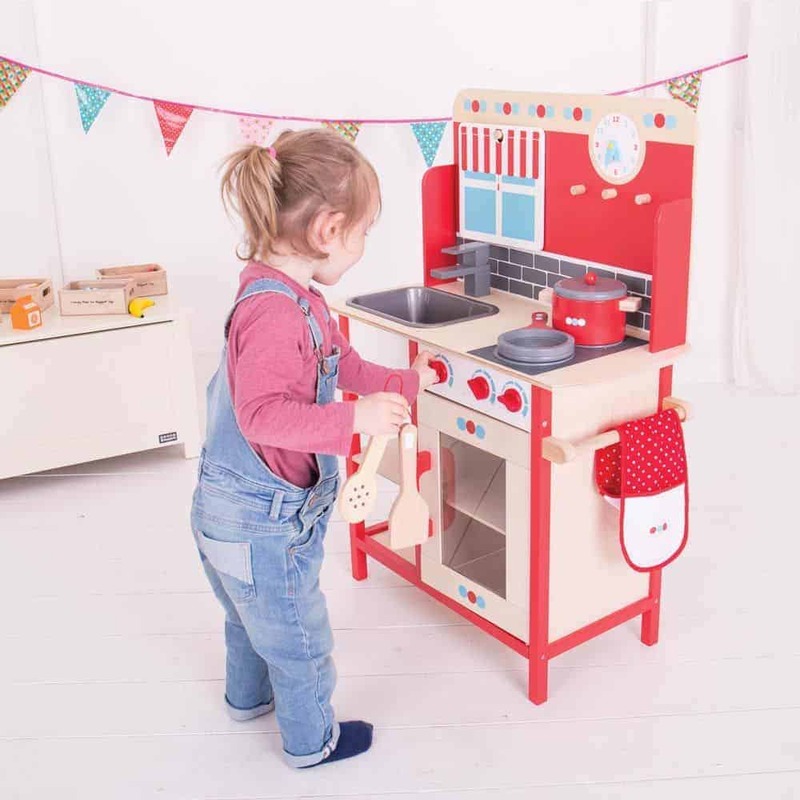 Once you have thought about all these things it should be fairly easy to pick the perfect wooden toy kitchen from such a fabulous range. This is a hands-down best seller and for good reason. It’s high quality, easy to put together and great for kids of all ages. The manufacturer recommends from age 3 but there are lots of very positive reviews from parents of younger children. And the taller work surface makes it ideal for older children to play with. 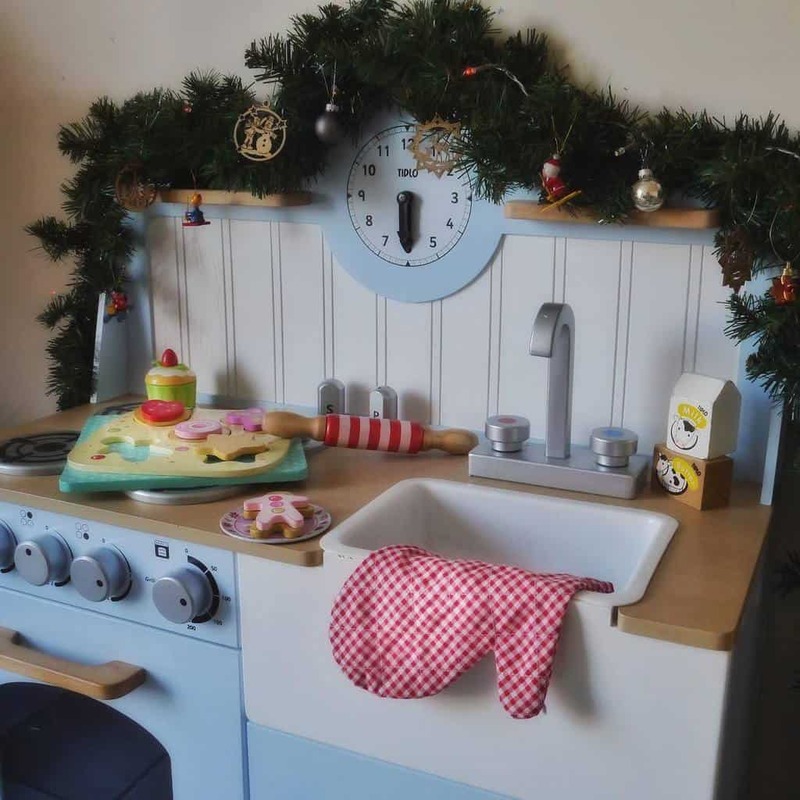 It features everything you would expect a toy kitchen to have but at a level of quality that is certainly a step up from your average wooden play kitchen. The Belfast sink is a gorgeous feature and the washing up bowl is removable which is really handy. There’s a realistic oven and hob with dials you can actually turn making a very satisfying click. And a nice big cupboard for storing food. Plus, you get a lovely clock, cooking utensils that slot into a handy shelf above the cooker, and a very cute salt, pepper, and washing up liquid. Everything a little master chef needs. It has a lovely vintage retro style. It’s big enough for two to play together. The size and quality mean it will last for years. Carry handles make it easy to move. The high 58cm counter top means years of play. And your child will LOVE it. This cooker is perfect if you have a small space or just want a more compact play kitchen that is easy to move around. And it’s stunning. 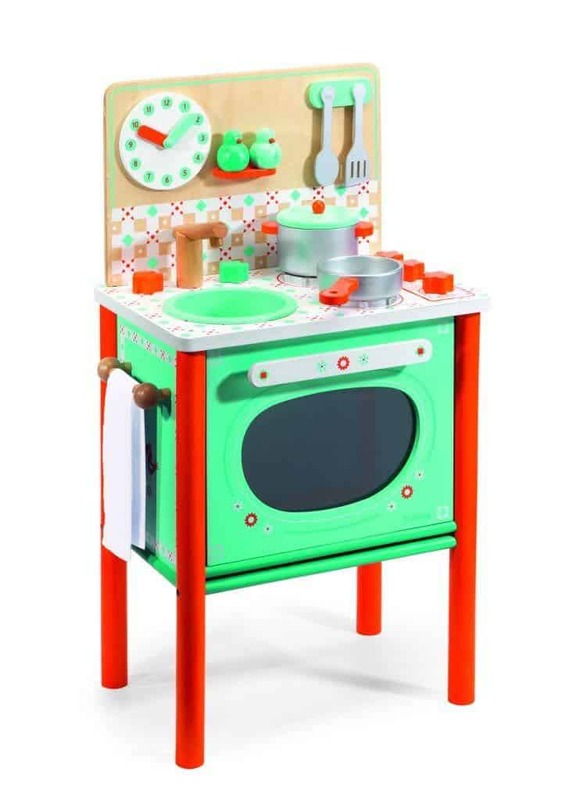 Like everything made by the French toy company Djeco this little kitchen has been designed to delight and inspire. It may be dinky but it still has everything you would expect from a toy kitchen. Including a sink, oven and hob with turning dials. Plus, it comes with loads of great accessories making it a bargain all in one set. The bird-shaped salt and pepper shakers are a really lovely touch as is the tea towel. The solid construction means it’s made to last. It’s quick to set up. Kids love the pull-down oven door. And the Design is stunning. There are so many great things about this little portable cooker. Its super compact as it’s just a hob meaning that although you don’t get an oven or sink you have the ability to set it up wherever you like. You can give children a step and have them cook alongside you in the kitchen, take it away on a camping trip, or simply have the ability to put it away at the end of the day. Perfect if you don’t have a dedicated play space and like the ability to tuck your toys out of site. You have a small space. You are looking for a countertop cooker. You want excellent quality and environmental responsibility at a budget price. Or you simply want to be able to put it away at the end of the day. And don’t forget the accessories!!! The range of wooden accessories and play food available is simply incredible. You might find yourself wishing they made grown-up versions. 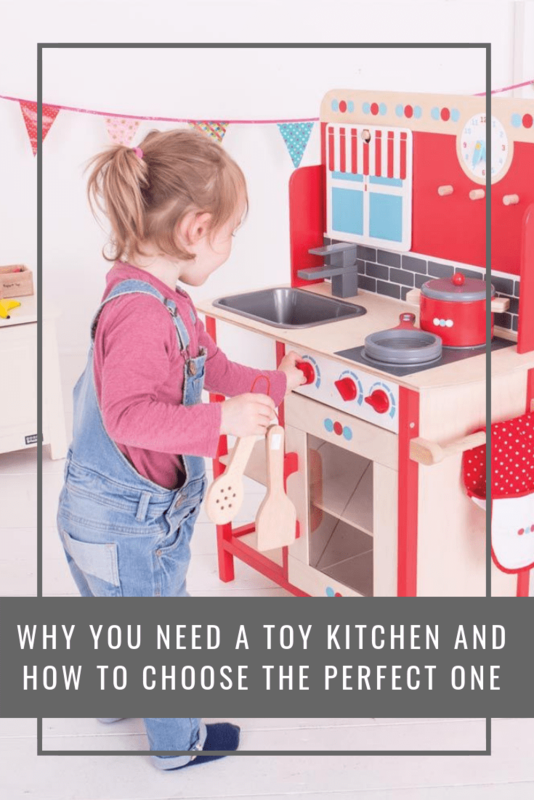 Whichever kitchen you choose, and however many fabulous accessories you end up collecting to go with it, this is a toy that is certainly worth the investment. There is a lot of discussion about how many toys children really need. With studies showing that fewer toys in a child’s environment actually improve the quality of their play. And for most people the pot of money to spend on them is limited. Meaning choosing a toy that has so many possibilities for play over so many years seems like a no-brainer. And if less is more, and the environment we are bringing our children up in matters as much as the games we are playing with them, then choosing a quality toy from a brand that puts children and the planet at the forefront of what they do just makes sense. I remember playing with a plastic toy kitchen when I was younger. I love the idea of a wooden one now. My kids loved their toy kitchen when they were little, I was always being served food from it!